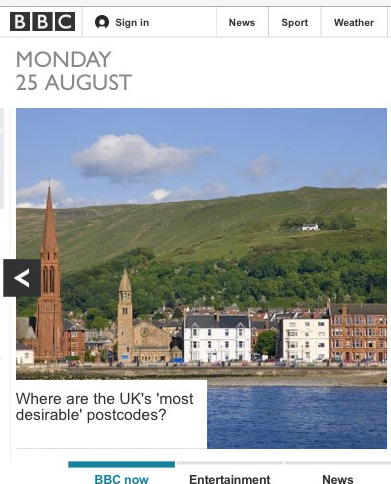 The BBC website chose a great photo for its headline article about the best places to live: the smaller of the two churches is where Deb and I got married. What happens when you fail at being a footballer? James Gheerbrant spoke to a few who have. Do you worry about your phone's battery? Let Yohana Desta's myth-busting banish your fears. Tim Challies shares a simple way to organise your praying. There's a lot being written about Mark Driscoll, most of which probably isn't that helpful, but Celeste Gracey, a member of the church, has an honest and hopeful perspective. In a similar speak-of-what-you-know vein, Jamie McCallum shows what a difference a daughter with Down's Syndrome can make. Chris Plante pinpoints the moment The Simpsons jumped the shark.